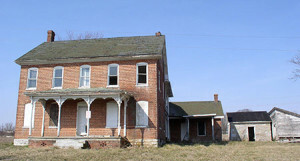 Home » Adaptive Reuse of Historic Resources » A Effort to Save History; BKG still endangered. Update Summer 2015. A Effort to Save History; BKG still endangered. Update Summer 2015. Why can’t history and progress cohabitate peacefully? 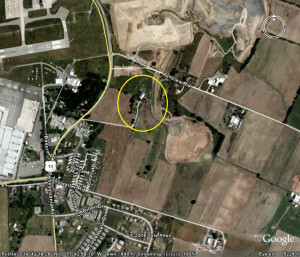 The Brumbaugh-Kendle-Grove (BKG) Farmstead sits across the road from Hagerstown Airport on land acquired to expand the runway in 1999. The farm was purchased by the Washington County Commissioners with grants from the FAA. As such, it is required to be used only for aviation purposes. The Federal Aviation Authority and the National Trust for Historic Preservation went head-to-head over the value of the 18th/19th century farmstead as opposed to FAA’s desire to clear the land. Following the Section 106 process, the agencies finally agreed on a plan that tilts heavily toward destruction. The plan does not include a “mothball” option, (mothball – to securely close the buildings and protect them from weather and other potential incursions) and insists that any reuse be airport-related. The farmstead is located near the end of the runway, across the road from airport structures, making many possible airport uses too far away for easy access among such uses. Mothballing would allow the structures to be preserved while the airport expands. At no time during the 106 process did FAA have to justify its rule that buildings out of the way of present or planned development must be removed. Needs change. Without a plan for this corner of the airport, we should make every effort to save our history. The farmhouse is solid, brick, mid-nineteenth century. The pierced-end brick barn is a magnificent space under roof, in good condition with chestnut posts, original fabric missing only a single hinge and graffiti in the grain storage room referencing local events and Grover Cleveland’s assassination. Push is coming to shove for the BKG Farmstead. 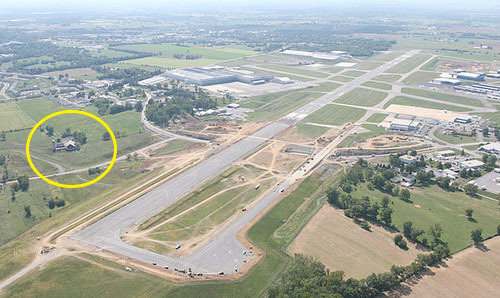 The FAA is pushing the airport to complete the Memorandum of Understanding (MOA) between it and the National Trust. Unfortunately, the MOA was loaded in FAA’s favor. Here is a farmstead across busy Route 11 from the airport proper, with no easy access between airport and farmstead. It presently works as a farm with cattle in the barn, but no tenants in the house because the house needs serious rehabilitation. 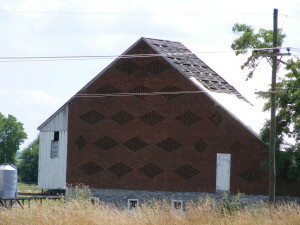 The Hagerstown Airport permitted “demolition by neglect” to this magnificent pierced-end brick barn until forced to require the farmer using it to do maintenance. The Hagerstown Aviation Museum Group needs a home but doesn’t seem to want this one, even at a dollar a year. Here is a magnificent pierced-end brick barn with vast yards of open space ready to be divided any way they choose– even with some fascinating 19th century graffiti on the granary walls for added spice. A sturdy two-story brick house with a full basement and attic could be filled with office space, an apartment, small displays and all the memorabilia in its collection. A stone smokehouse and brick washhouse near the dwelling house could also be used for displays. Get involved. Encourage the Aviation Museum to reconsider this site. Write to your senators, (who have invested millions of your money into this airport) suggesting that the FAA be sensible and sensitive to historic preservation. Surely the Board of County Commissioners, actual owners of the site, can negotiate a happy end for one of our historic treasures. Make your calls, write your letters for historic preservation.